This was part of the series that Peter Helck did for Esquire magazine in 1944. 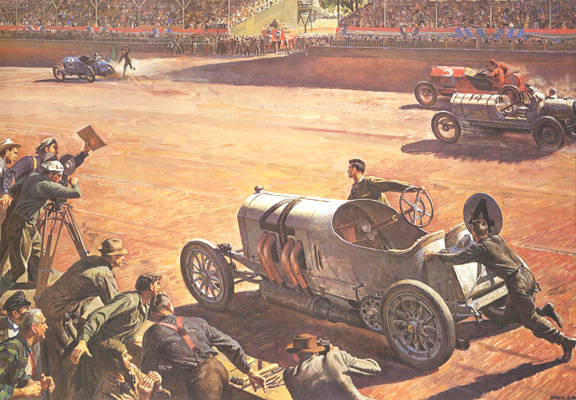 It records a dramatic scene from the 1912 running of the Indianapolis 500. Ralph DePalma, after having led most of the race in his white, number 4, Mercedes, had a mechanical breakdown on the second to last lap. He and his riding mechanic jumped out of the car and vainly attempted to push it to the finish line and claim victory. This painting appeared in Esquire with a quote from Capt. Eddie Rickenbacker (who had been a spectator): "Eighty thousand people were there; they saw the sweat on his face, they knew what was going on in his mind. They roared out a cheer that has never again been heard at Indianapolis. You have to fail in a peculiar and wonderful way to earn such a cheer."